Ahead of their White House talks on Tuesday, March 20, President Donald Trump and the Saudi Crown Prince agree on a new Supreme Committee to coordinate military and diplomatic efforts for curbing Iranian expansion. The United Arab Emirate is the third member. This committee, to focus on coordinated operations, will consist of the three governments’ national security advisers. For final decisions, they will call in President Trump, Saudi Crown Prince Muhammed bin Salman (MbS) and the UAE Emir Sheikh Muhammed bin Zayed Al Nahyan (MbZ). White House sources reported that the new group would be ceremonially launched in Washington this week. The Emirates national security adviser Sheikh Tahnoon bin Zayed Al Nahyan will come over to join the event. The emir himself is expected in Washington soon. 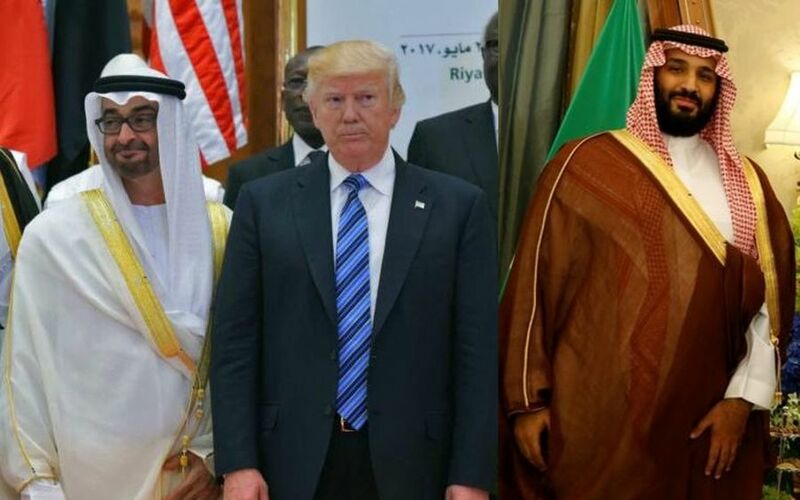 US and Saudi officials confirmed Tuesday that the new Supreme Committee’s mission would be to execute the goal shared by the three governments, namely, to stall Iran’s expansionist designs across the oil-rich Gulf and the Middle East. DEBKAfile’s sources report that this move is consistent with the decision which President Trump is widely believed to have reached for taking the United States out of the 2015 nuclear with Iran. Intensive discussions are taking place in the White house on timing; whether Trump should make the announcement when the next deadline for re-certificating the accord comes up in mid-May or jump the gun in March or early April. The US, the Saudis and the UAE are meanwhile checking to make sure that their military assets are in sync and ready for potential repercussions. The new Supreme Committee will fill the cohesion void left in the Gulf Cooperation Council by the refusal of two of its members, Qatar and Oman, to go along with the tough policies pursued by Saudi Arabia and the UAE since MbS took over the reins of government in Riyadh three years ago. The princes of Zoan are mere fools; The advice of Pharaoh’s wisest advisers has become stupid. How can you men say to Pharaoh, “I am a son of the wise, a son of ancient kings “? And I will make justice the line, and righteousness the plummet, and hail shall sweep away the shelter of lies, and water shall flood the hidingplace. 18. And your treaty with death shall be nullified, and your limit with the grave shall not endure; when an overflowing scourge passes, you shall be trampled by it. 19. When it passes, it shall take you, for every morning it shall pass, by day and by night, and it shall be only terror to understand the message. 20. For the bed is too short for one to stretch, and the ruler-it shall be narrow when he enters. 21. For like the mountain of breaches shall the Lord arise, like the valley in Gibeon He shall be incensed; to perform His deed, strange is His deed, and to perform His work, strange is His work. 22. And now, do not scorn, lest your pains become strong, for a complete destruction have I heard from the Lord God of Hosts upon the entire land. Is that from Harry Potter? No…Ivan’s off his meds again??? What is this childish drivel? “the new Supreme Committee’s mission would be to execute the goal shared by the three governments, namely, to stall Iran’s expansionist designs…” The word STOP would have sounded a lot more convincing. “stall” leaves an awful lot of wriggle-room for the US to continue to avoid direct engagement. If you need allies like Saudi Arabia to deal with Iran then you ste missing the point – it is not about any faction of Islam – it is about the belief system which has no room for anyone except Muslims and those who live a life under sharia and use jihad to put others down because it is a supremscist way of life. For this “action group” to be able to accomplish its goals, they need the Israelis to be actively and PUBLICLY involved in every aspect————otherwise, it’s doomed to failure like Obama and Herman Munster’s grossly flawed “Nuclear Deal” with Iran. All these grandiose plans are nice and dandy: BUT, Eventually, only Israel will be left, (again) – with actually Doing all the Real, dirty work about the Iran nuclear ambitions ! More hot air being blown by the airheads running the Western empire. What I’ll tell you is that your little dream of having a Mossadi Kurdish statelet is now shattered, and I commend the Turks for that. The other thing about your regime change flop, you snakes employed an entire rainbow of useful idiot Jihadi mercenaries to do your dirty work, and these are also collapsing all over Syria. When you cobble together groups of stupid head choppers, they will fall apart. The Syrians, Iranians and Russians have more honour, vigour and determination than your paid lunatics will ever have, – after-all justice is on their side, countering your devilish plans for the partition of Syria! So best thing would be to stop pandering to Wahhabi vermin and make a good deal instead with the Russians and Iranians. They can be negotiated with, provided mutual respect exists. But we all know the answer to that, Uncle Bibi the Yahoo has you all scared of the evil Iranians like a good little flock of sheep. Instead, you prefer to sleep around with Wahhabi boot-lickers thinking you’re doing gods work, and when that terrorism inevitable blows back in your faces, and those of others, you’re the victims! Your American jackass friends (Neocons) also fail to see the errors in their ways after 10 years of CONSISTENT failed policy in the Middle East. And where are all these geniuses from? Israel of course. You simply cannot coexist with anybody less than puppets. Yes, Trump may get impeached, the Gulf states may turn against US and Hizballah/Hamas/Syria/Iran will attack Israel with Russian/Chinese help. The only thing Mossadishu has not accounted for is the collective Israeli intergenerational memory of the thousands years of persecution of the Jews. The Jews have no place to run to from Israel, every little dictator despises them and every “democracy” is afraid of them. When a nation is faced with annihilation it can either win against all odds or completely burn down the entire neighborhood. As the ME burns the heavy metals in the fallout will kill life on the entire Eurasian continent i.e. Europe, Russia and China that have not burned down will slowly lose most of their population. Europe and to some degree Russia deserve it for the prematurely disembodied millions of Jewish souls. China and SE Asia still have a choice to make. Israel will not think twice about using its nuclear arsenal because it is already used to being condemned by most of the world in the UN. The former Inquisition masters, the former commies and the todays mullahs might not enjoy killing the Jews as much as they did in the past, technology is a great equalizer. Success in the development of hi-tech weapon systems hinges on understanding of nature’s laws which by itself is based on the assumption of a purpose for creation. Judaism provides a narrative for the purpose of creation. That is the reason for Jewish creativity. No Jesus, no Mohamed, no Buddha can take it away from a Jewish mind. You either have to learn to live with the Jewish state on the map or die in terrible physical and spiritual pain knowing that you have caused your own annihilation. I highly doubt that the Iranians are stupid enough to want to “wipe Israel off the map” unless there is a good reason to do so, such as for example, if Israel attacks Iran or Iranian allies in a very serious way. Alot of that talk is bluster. Don’t forget that Hizb-Allah was founded in response to Israeli aggression in Lebanon during the early 80s, when Ariel Sharon got Phalange militias to slaughter Shia. The Iranians realized they needed to form their own militia to protect the Shia. Not long after, Israel was kicked out of Lebanon. It worked. Nasrallah and Hizb-Allah are providing more security and deterrence to Lebanon than the stripped down Lebanese armed forces are, who are not allowed to even have air defenses in order to allow the IDF to do what they please and fly sorties at their own choosing. Did you think some people wouldn’t resist this arrangement? You invade Lebanon, you face body bags and blowback, sorry Shlomo. Hizballah is looking out for its own people in the Levant, they are governing and providing security. They are not suicidal maniacs as painted in the media, unless it requires them to die as Shahid to defend their nation from aggression. This is where Western propaganda comes into play, portraying Iran and its allies as crazy lunatics. Anything couldn’t be further from the truth. The cockroaches in Western media are pro-Zionist, and manipulate the narratives to suit themselves. Considering that most Neocons who set their sights on destabilizing Iran are Zionist Jews or Zionist Evangelicals, Iran has every right to be concerned with this onslaught of criminality and to defend against it. The aggressors against Iran are the US and Israel. Nuclear weapons Iran wants are insurance, not a weapon that will be used so freely. Mullahs are not stupid. But Western media and governments are, thinking people will think otherwise. Syria is an Iranian ally, and Iran is doing what allies do when under attack – helping. This is painted as something wrong by the Israelis and Americunts, who cannot bare to fathom others defending their allies in times of need. No, only Americunts are allowed to do that! Sorry, but it doesn’t work like that. Zionists need a reality check, and stop fuelling Wahhabism. We know your agenda is to keep the Ummah divided with infighting, maybe it works for some weak Arabs who fall for the trap, but not for Persians or Turks, who are much more strong. If you want to divide the region with Roman tactics, you will suffer blowback and deserve it. Mosssadishu wrote: I highly doubt that the Iranians are stupid enough to want to “wipe Israel off the map” unless there is a good reason to do so, such as for example, if Israel attacks Iran or Iranian allies in a very serious way. I assume the Israelis can’t sleep at night. They are wondering how “seriously” they can pay Hizb for its terror before being nuked by Iran. You forgot that the Jews already tried for 2000 years to be nice and not to bother anybody, it didn’t work. I suggest instead that you don’t sleep at night and wonder how much poison can the mullahs spit before Israel castrates them. By the way, if you live in the US or Russia there are plenty of very “serious” people who can’t wait to do the same to your kind. Remember Central Asia in the 1920s, Crimea in 1945, Afghanistan in the 80s, and more recently Chechnya and Yugoslavia, the mass graves full of Muslim men there were just a preview of what is coming to your neighborhood in Detroit or NJ. You are barking up the wrong tree. The Jews have no guts to push you into the mass graves, but the “serious” people can’t wait to start the “fun”. An old aksakal (wise man in Uzbek) in a Samarkand bazaar taught that if you are too scared to see the truth now, you’ll have to pay dearly for your blindness later. The Jewish Khazars stopped the Muslim armies in the Caucasian mountains from invading Christian Eastern Europe. The newly minted Christian Russians “paid” the Khazars by destroying their kingdom. That is the reason why Bibi is extending his hand to his cousin Ishmael (the Gulf states). He would make peace with Iran if the mullahs would recognize Israel as a Jewish state. They will not because they need an “enemy” to justify the IRG corruption. The cradle of human civilization (Mesopotamia) has accepted servitude in the name of Islam from corrupt rulers. The Russians did the same in the name of Communism, it lasted 73 years. Europe is committing suicide in the name of political correctness. China is walking in Russia’s footprints. I wonder how long these entities will last before disintegrating into failed states. Time is on the side of the Jews. I can tell you Iranians won’t be shitting where they eat any time soon, to the chagrin of you Zionists. The government may not be ideal, but Iranians won’t destroy their country for some Anglo Zionist rats and their delusions of freedom. We already saw the recent attempted protests that Mossad and the CIA tried to fan in Iran, using Kurdish proxies to foment ‘regime change’. It was a pathetic fiasco, a total flop. Most Iranians rallied behind the government, preferring stability than delusional FreeDUMB projects made in Tel Aviv and Vichy DC. But your lame media played it up as if it was…the next 2009 “green revolution”. It may have worked in Ukraine with Maidan, but Iran, Russia and China are harder nuts to crack. Even in Turkey, the regime change attempt flopped big time in the summer of 2016. Anglo Zionist rats threw all they could – from a Gulenist coup, to assassinating the Russian ambassador and shooting down a Russian Su-24, but Putin played his hand well and Turkey awoke. Sounds like your regime change wet dreams are no longer that wet. Like the Russians did when they threatened Trump that they would reveal the tapes of the Russian prostitutes peeing on him? I thought there was only one Dotard. Obviously, I was wrong. There are three. The first one will be impeached very soon, the second, a loser, failed in Yemen, in Syria, in Iraq and in Qatar. The third will find himself scrambling to pick up the pieces. this expectation is D.O.A. – dead on arrival. Since when the Saudis care about Israel? For over fifty years they have had a hand in shedding the blood of Jews in the name helping Palestinian with their money. How many Jews live in Saudi Arabia, Dubai, Bahrain or Kuwait? Which of these so called friend of Israel have any relations with Israel? You never think of Saudi radical mullah who going to control the military resources when this puppet government toppled in the future?